How do you start a research project? What are the hallmarks of a successful research project? 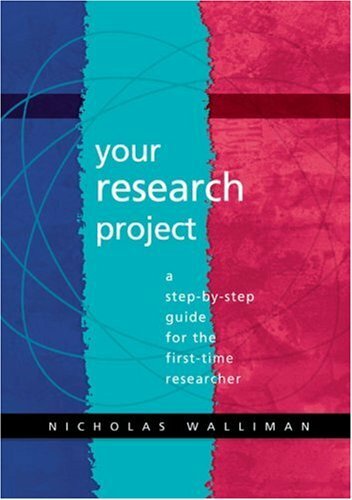 These questions are answered in this practical step by step guide to doing a successful research project. Nicholas Walliman is a qualified architect and Senior Lecturer in the School of the Built Environment at Oxford Brookes University and a researcher associate in the Oxford Institute for Sustainable Development. After many years of practice in architecture in the UK and abroad, he returned to academic life to do his PhD. This experience raised his interest in research theory and methods, and he was subsequently asked by the university to write a distance learning course to guide postgraduate students embarking on research degrees. This course provided the raw material and incentive for writing this book. He has subsequently published several other books on research theory and methods for students and practitioners at various levels of expertise. He is currently conducting research with a team of architects and environmental scientists as part of the Oxford Brookes Institute for Sustainable Development. They are engaged in nationally and internationally funded projects on a range of aspects of building technology, such as energy saving building envelope design, mitigation of the effects of floods on buildings and advanced construction methods. He has published numerous research papers on aspects of architectural technology. He is also supervising several PhD and Masters students. Despite this emphasis on science and technology, his work with research students covers many other aspects of architecture and its relationship to society, such as vernacular architecture, the effects of westernisation, architectural education, conservation, administration and sustainable design.